An alligator gave police quite a chase, re-emerging into the Atlantic Ocean nearly as quickly as it appeared on the South Carolina beach. 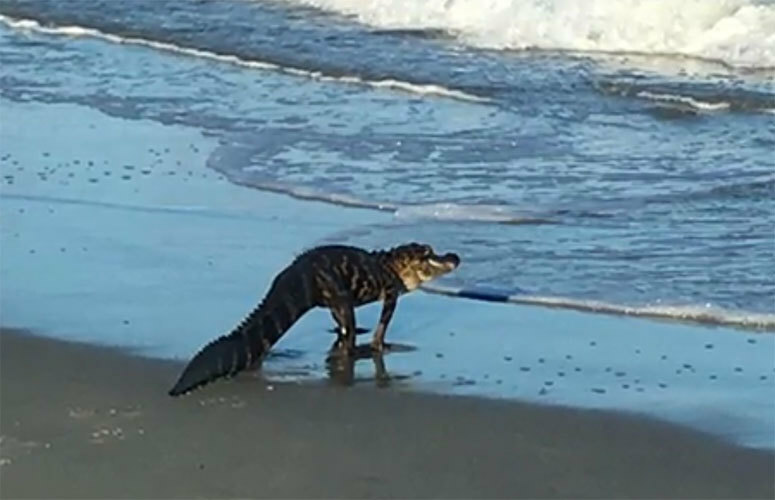 Sharon Martin and Nancy Thompson did the right thing by calling the police when they spotted an alligator on the beach in Myrtle Beach, South Carolina. However, the story takes a wild, unexpected turn from there. Myrtle Beach Online reports the gator was spotted by the two friends when it came out of the Atlantic Ocean and began tanning, similar to many beachgoers. But when police arrived … the gator went back into the ocean and swam around for onlookers. “It was pretty frightening to see an alligator coming out of the ocean,” Martin told the website. Myrtle Beach Online reports the police and beachgoers watched the alligator swim near shore for some time before it disappears from sight. Over the next 40 minutes the gator didn’t reappear so the police considered the case closed.